Groundsel Bush ( Baccharis halimifolia, ASTERACEAE ). The caterpillar eats the flesh of the leaves, leaving the skeleton of veins. 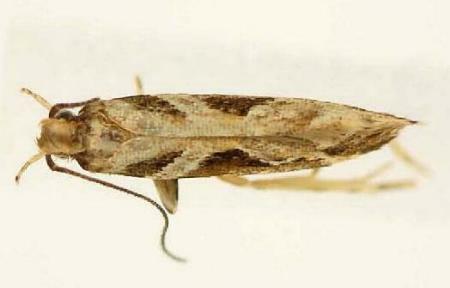 The adult moth has brown forewings sometimes with pale 'V' patterns, and plain brown hindwings. The species has several generations each year. The caterpillars were tested on 65 different plants. They walked away from the 64 other plants, and only fed on the Baccharis halimifolia. About 25,000 moths were mass reared, and released at five locations. but does not seem to have had any impact on the weed. Volume 23 (1900), pp. 225-226. CSIRO Publishing, Collingwood (2012) p. 90.